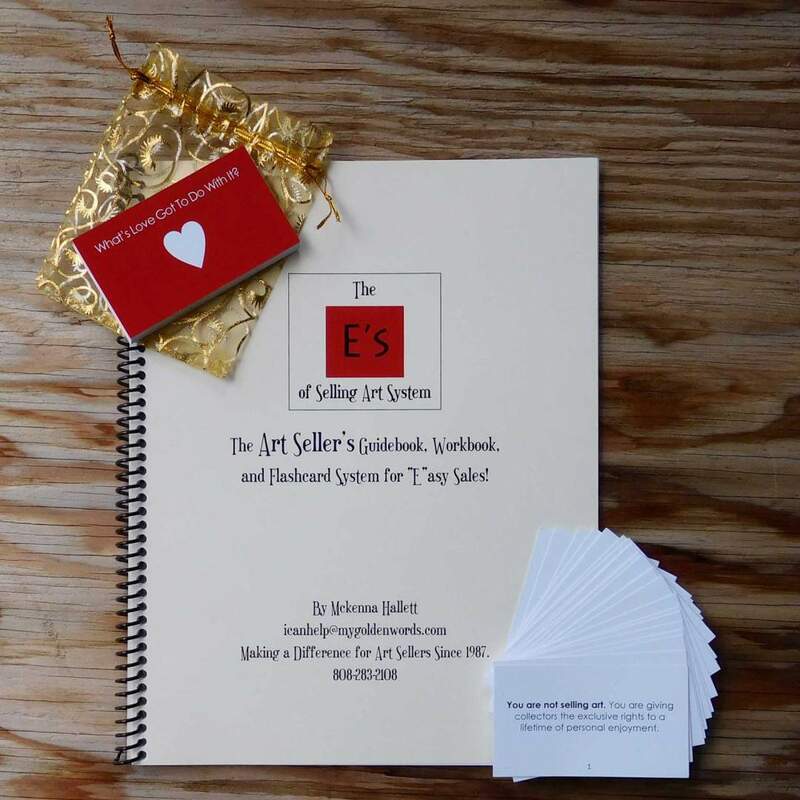 These posts are based on the successful “E’s of Selling Art System” that has been shared with many hundreds of artists at seminars for over 30 years. Eventually, I published the guidebook pictured here. (And now, I have even added the “Find Loving Homes for Your Art” weekly podcast.) So many ways to gain confidence and find your authentic sharing spirit! Scroll to enjoy nearly two years of articles! There is a multitude of ways to let the air out of the balloon. The best is to create a slow leak. But when someone needs to “think about it” you certainly need to keep the “sharp objects” as far away from that balloon as possible. Here are some tips that will help in the here and now – the critical moments of final decisions. This is an “exercise” that can be done anywhere at anytime. It can take just seconds and it can transform you. It is a simple, but time-tested way to capture your authentic self. It’s a task that should become a daily habit. What exactly is someone purchasing from you? Are you giving them what they need to “feel” satisfied by their purchase? Let’s look at the elephant in the room, shall we? Let’s look at the motivation behind every purchase. They really believe they will go home and buy from you online. They really believe that when they measure the wall or buy that new piece of furniture, they will have the perfect spot for your art. And you encourage them to go to your website. And they really are excited and really believe that they will do just that. Do they? You are losing sales every time you put your business cards or brochures out on display. (No, I’m not. Yes…you are!) In fact, as you will learn in this post, you are losing more than immediate sales, you are losing future sales opportunities, too. Chit Chat. It’s a natural way that we humans “sniff” one another. We can keep ourselves at a “safe” distance by talking about the truly neutral subjects. But your art, your talent, your vision, AND your livelihood requires stepping into relevant two-way conversations. Avoid becoming uninspiring, unattached, and unpaid for your creativity by avoiding irrelevant conversations. Do you know what it takes to really earn someone’s trust? Do you know how important it is for you to show you understand your collector in order for them to care enough to try to understand you? Believe it: They won’t try to understand what you are saying if they don’t think you are trying to understand them. While you may have many years of experience at hundreds of retail Art Fairs, you may fall into the trap of implicit bias. If you are, you are missing income opportunities at every single show. If you are new at presenting your art in public, this article can help you avoid the trap in the first place. Something different is going on here. And if you don’t pay attention to this critical moment for your potential collectors, they will take your card and promise to “be back”. Learn what to do to avoid apathy and lost sales.